You may have seen headlines recently about Jerry Seinfeld, a Wall Street Survivor favorite, being a Billionaire. Or rather, a 3-Billionaire, because that’s how much “Seinfeld” has made in syndication. (What did you expect? “Bee Movie” wasn’t the thing paying for this car collection.) Many other beloved TV characters have made their way into syndication millions as well: the Fresh Prince, Raymond & Co, the Tanner family… the list goes on and on. Basically, if you’re watching it on Nick at Nite, somebody got rich off the rights. After their series finale back in 2004, “Friends” also made headlines for their extremely high syndication price. But the over $944 Million “Friends” made in syndication (yeah, you read that right, $944 Million) is only a small portion of the total revenues that the show has brought in. Let’s take a look at how those involved with one of our favorite sitcoms ever used a common tenant of strong investing, diversification, to make everyone involved a LOT of money. In finance, diversification is a way to reduce your risk by spreading your assets among a number of different investment vehicles. 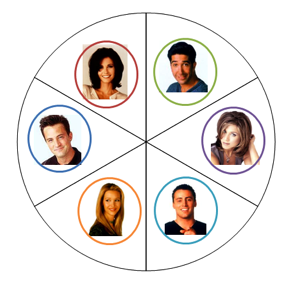 Like saavy investors, the creators of “Friends” laid a great foundation for success by writing a show about six very different characters. By design, the show spread the focus equally among Monica, Ross, Rachel, Chandler, Joey, and Phoebe. This demonstrated another tenant of smart investing, they thought long term; they knew that focusing on one or two story archs would get worn out quickly, so they gave themselves plenty to work with. Sick of the “Ross & Rachel” saga? Monica and Chandler start a secret affair! Bored when Mon and Chanandler Bong get married? Boom! Joey is tormented by unrequited love. Given that the series ran 10 seasons and produced 238 episodes, it’s a good thing they had six great characters with which to build storylines. Ok ok, so the content of the show was a great example of Diversification paying dividends. We get it. Now let’s talk cash. Contrary to what the leading paragraph of this article would have you believe, not all shows are destined for syndication glory. That is, smart investors who diversify certainly wouldn’t put all of their eggs in the syndication basket. This is where first-run ad revenue comes in, the money a show makes from the broadcasted commercials while they air. Typically, more ratings = more ad revenue, so “Friends” pretty much nailed it in this department. Their finale reportedly brought in $2 Million per 30 second commercial. Yeesh. Not all of the episodes would have made that astronomical of an amount, but there were 238 episodes in total. Even if the numbers were much smaller per commercial, that’s a lot of money over the course of the series. Now, syndication isn’t guaranteed, but as we’ve seen above it can pay a pretty penny. The “Friends” cast was smart by investing in the possibility of syndication fairly early on. Before “Friends,” the only television stars who negotiated for syndication royalties were also owners of their shows (Bill Cosby and Jerry Seinfeld for example… you know, two Billionaires). The cast of “Friends” set a new precedent here; they diversified their paychecks to include salary, residuals AND syndication royalties. Because “Friends” is showing no sign of ever leaving the air, those turned out to be some pretty great moves. “Friends” was successful enough that fans not only wanted to watch the show, but also own the show. All 10 seasons are available on DVD for your viewing pleasure. The metrics on DVD sales are notoriously, and mysteriously, well guarded. However I think it’s fair to assume that they sold more than a couple of these. Also, here’s a tip for all the burgeoning television stars out there: DVD/Digital sales are a way to diversify your earnings should you be unable to broker syndication rights. The rest of the “Seinfeld” gang, for example, were left out of Jerry’s syndication earnings. (That’s why he’s the only one in the Billionaire’s Club.) As a result, they famously held out to get royalties from “Seinfeld’s” DVD sales. I’m a “Seinfeld” Box Set owner myself, so you’re welcome, Julia Louis-Dreyfus, Jason Alexander, and Michael Richards. Nerd alert: I am also an owner of the “Friends” soundtrack on CD. Not to say that CD sales are a revenue stream for TV shows nowadays… but it’s a good example of “Friends” expanding their number of “egg baskets.” They took advantage of the show’s popularity to drive revenue from the merchandise front in a number of ways: soundtracks, Trivia Games, giant Central Perk coffee mugs, they made it all. I’m not saying CD sales were equivalent to their $944M cash cow, syndication, but as a form of diversification they certainly maximized merch as a revenue stream. In retrospect, did the owners and cast of “Friends” need a bevy of revenue streams to make money? Probably not, one or two of the options above would have been just fine, but they invested in other possibilities as well. Let this be a lesson to us all as we invest: diversify, diversify, diversify. “Friends,” could they BE making any more money? But the point is, they didn’t have a crystal ball to tell them that reruns of the show would air for another 500 years on TBS. The developers and cast were smart to invest in that.